It tastes like dessert, but is healthy enough for breakfast! 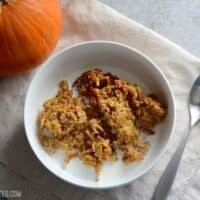 Baked Pumpkin Pie Oatmeal is a great "fix ahead" breakfast option. Preheat the oven to 375 degrees. In a large bowl, whisk together the pumpkin purée, brown sugar, eggs, vanilla, pumpkin pie spice, salt, and baking powder until smooth. Whisk in the milk. Mix the dry oats into the pumpkin mixture. Coat an 8×8 (or similar sized) baking dish with non-stick spray. Pour in the pumpkin oat mixture. Bake in the preheated oven for 45 minutes, or until the center no longer looks wet and the edges are lightly golden brown. Serve hot right out of the oven or refrigerate until ready to serve. Can be eaten cold or reheated. Top with milk, maple syrup, whipped cream, or nuts.